Here is is. In black. Thankfully, the SRS-X3 also comes in red and in white colorways if you'd like to try to be a little different for once. It's one of the audio behemoth's latest entry-level portable Bluetooth speaker that's acceptably priced in at $150, nicely made and designed, weighs nearly as much as the slightly smaller SoundLink Mini and features dual full-range drivers along with dual passive bass-reflex radiators powered by a built-in rechargeable battery that lasts for up to 7 hours. In other words, the SRS-X3 is Sony's best sounding compact portable speaker yet. But unfortunately it's not perfect and does come with a few caveats that might even deter you from putting it on your "to buy list". Before we spoil the bad news, here are some good things we found about this brick of a speaker. The SRS-X3 has a very likable minimalist, understated and svelte cubic-shaped design that’s an exact replica of its much bigger siblings from Sony – the SRS-X5, SRS-X7 and SRS-X9. The front speaker grille takes a large role in the SRS-X3's serious-looking design as it shapes its facade with a utilitarian flat perforated metal grille. The only speaker in Sony’s SRS-X series that has taken up a more rebellious, albeit still very much simplistic design, is the SRS-X2, which trades in the squarish styling for a more rounded pill-shaped design. Almost Bauhaus-like in its execution. But what the SRS-X2 lacks is the same powerful bass response that's present in the rest of Sony's mighty SRS-X lineup of wireless speakers. 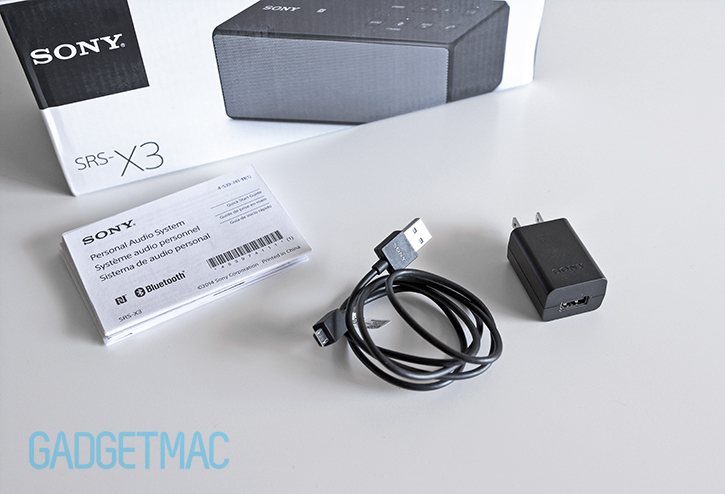 Inside Sony's typical and uninspiring packaging you'll find the SRS-X3 along with a few of its buddies: a Sony branded micro-USB charging cable and a Sony branded wall adapter. Props to Sony for includes a 1.5A USB wall adapter, because you're going to need to charge this thing somewhat more quicker than what your USB computer port can afford. While we're on the subject of charging, we timed how long it takes to fully charge the SRS-X3 using the included USB wall charger and we were pretty shocked by the results. It took exactly five hours to fully charge this chunky piece of kit. That’s 5 freaking hours just to fully charge a compact portable speaker using the supplied USB wall adapter with a battery life expectancy of up to 7 hours. That’s what we call frustrating. It really doesn’t make any sense. Bose’s SoundLink Mini also offers up to 7 hours of battery life, but charges much quicker in about 3 hours, which is within the acceptable time frame considering it can provide as much as 7 hours of wireless music streaming. Sony, you really need to improve on this when you release your next gen X3 speaker. Another noteworthy speaker is the UE Boom, which has a 15-hour battery life yet charges in less than 4 hours using a similar USB wall adapter that is included with the SRS-X3. 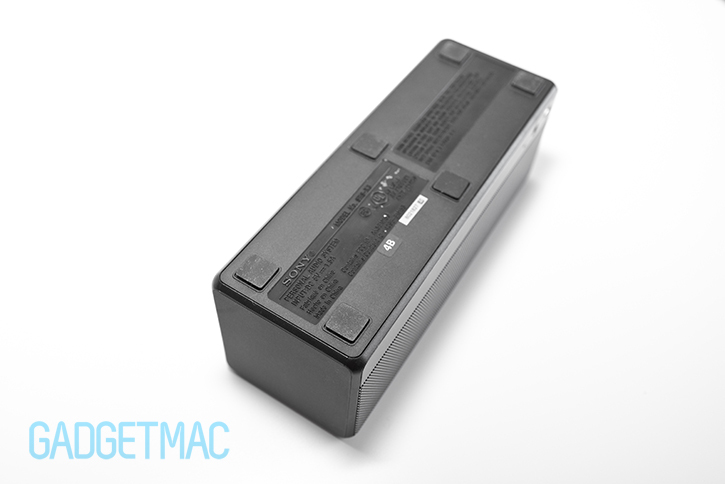 Hopefully that gives you a clearer idea of how these individual speakers differ when it comes to battery performance. And it isn't looking great for Sony so far. Not to mention that you can't charge and use the SRS-X3 at the same time. For some unknown reason the X3 only charges when it's powered off, which may annoy a lot of users. We know for a fact that this isn't an issue on Sony's slightly more expensive SRS-X5 model, which apparently even gets louder when it is plugged in to charge. We even confirmed this when reading the X3's user guide where Sony states that you should be charging the speaker when it is turned off. Really Sony? I'm shaking my had right now. When it comes to the build quality, the SRS-X3 feels solidly put together using decent materials. 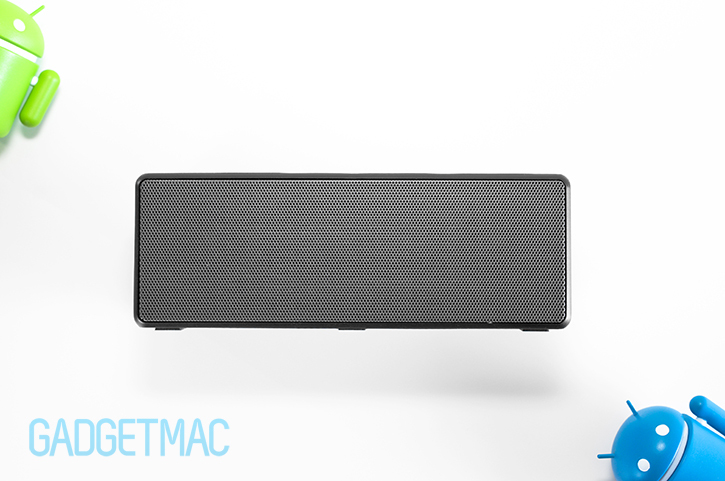 Most of the speaker is in fact made from plastic, and not the kind of plastic that will impress you. Nonetheless, the heft and brick-like construction is still very much present. Sony didn't use any premium materials here, but we do like the rubbery material that makes up the top, sides and portions of the back giving the SRS-X3 a pleasant soft-touch feel without the use of a matte rubbery coating which many companies use to coat their speakers. And unlike these coatings which ultimately scratch and wear off, the SRS-X3's rubber is in fact made out of seemingly thin layers of rubber that were applied over the plastic enclosure and seamlessly part of the construction which looks great in person. You can also see that parts of the SRS-X3's nicely rounded, black-colored plastic bezel borders are almost reminiscent of a Rubix cube-esque construction styling in the way that this particular trim element of the SRS-X3 creates this dividing bordered outline around the various rubber covered panels around the speaker. This becomes more visible when looking at the red or white colored SRS-X3 due to the contrast between the black borders surround the colored rubber surface areas. It makes for a really neat looking styling that Sony created, which is a interesting design language that is also present in its Xperia line of tablets and smartphones in some form or another. 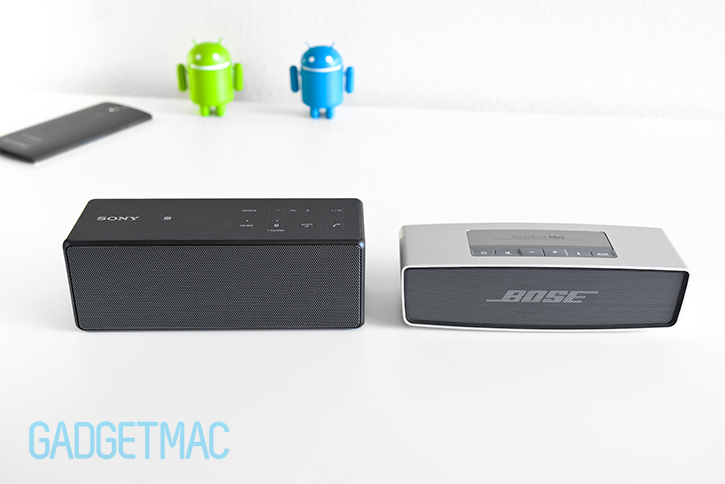 Comparing the SRS-X3 side by side with the Bose SoundLink Mini is like trying to compare an iPhone 5c with an iPhone 6. They're obviously two different beasts in terms od design, but also in terms of materials. The build quality and aluminum unibody design of the SoundLink Mini is really what will impress you the most compared to the SRS-X5, which is in fact bulkier. The SoundLink Mini's low-profile form factor convinces you to carry it with you more so than the SRS-X3. And that's funny since both speakers have the same battery life, and features in general yet the SoundLink Mini still manages to output powerful bass better than any other similarly sized portable speaker on the market. Next to the SoundLink Mini by Bose, Sony's SRS-X3 is the best sounding portable Bluetooth speaker we have ever reviewed. That is, as long as you listen to music with the volume dialed on medium. At just $150 (slightly cheaper pricing can be found on Amazon so shop around), you're getting an equally incredibly rich audio experience afforded by the more expensive $200 SoundLink Mini. The bumping great difference between these two notorious speakers is that the SoundLink Mini does have a more impressive and premium all-aluminum unibody construction with a slightly smaller form factor. Sound performance stands on mutual grounds between the two, however, the SoundLink Mini is the only one capable of pushing a balanced low-end across the volume spectrum while the SRS-X3 loses some of its deep and punchy mid-end bass response at full volume. That said, we still prefer it over the SoundLink Mini due to its lower price and equally impressive sound quality. A quick look at the bottom of the SRS-X3 reveals that instead of using a single rubberized surface, there are six small rubberized feet to provide traction for the speaker when set on a table. These feet do their job to keep the speaker steady and help absorb the transfer of vibrations caused by the dual bass radiators inside the unit. The bottom is otherwise made from lower-grade plasticky plastic. The SRS-X3 features flat, albeit still tactile button controls seamlessly integrated into the rubberized top surface including the unit's power on/off button, volume up/down, Bluetooth pairing, a button that lets you switch from Bluetooth to a wired audio input connection mode, and a answer/end call button for use with the SRS-X3's built-in speakerphone functionality, as well as a 'sound' button also known as the ClearAudio+ button (more on that later). There are also several LEDs to indicate which button has been selected and activated as well as a charge LED indicator, which doubles as the speaker's low-battery status indicator. The SRS-X3 only lacks a play/pause and skip track buttons leaving it to your audio source to handle such controls. To pair with the SRS-X3 you can do it effortlessly using its tap-to-pair NFC Bluetooth pairing process if you have a compatible NFC supported Android device. 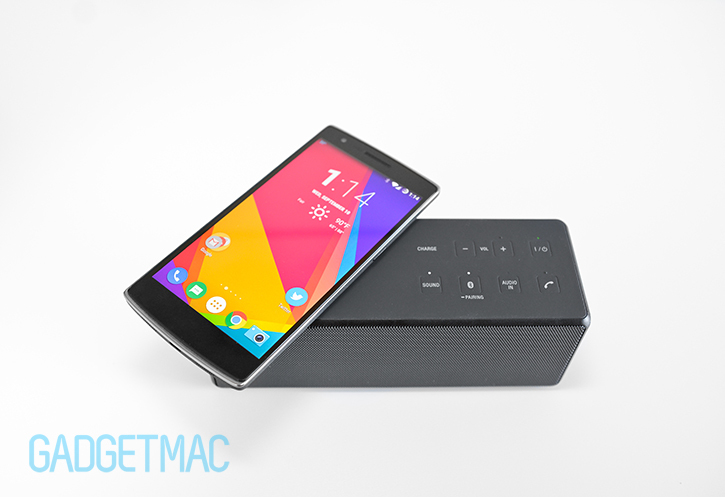 This should also technically work with the iPhone 6, but we have yet to test this. 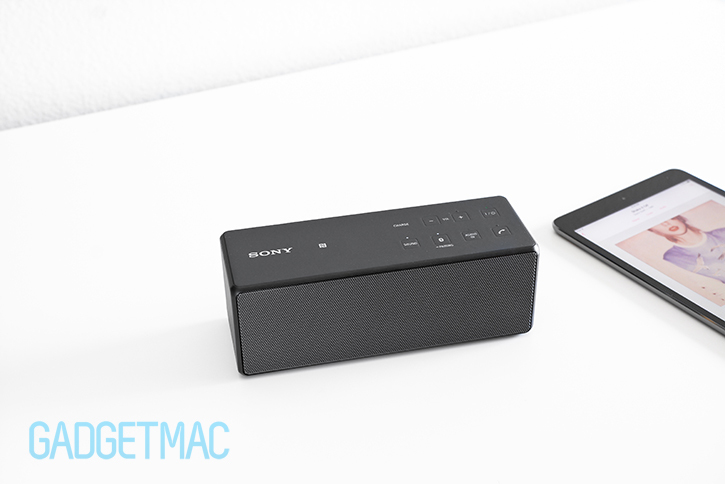 When you tap your device over the NFC logo on the top surface of the speaker (right next to the Sony logo), NFC pairing will automatically connect the two devices. What surprised me was that when I tried to pair my OnePlus One while the SRS-X3 was turned off like you would normally do using NFC pairing, the SRS-X3 actually turned itself on in order to pair. So you actually don't even need to bother pressing that power button when using NFC Bluetooth pairing, which I found quite unusually awesome. And because the surface of the speaker is covered in rubber, you don't need to worry about scratching your device against the speaker. If you don't have an NFC-enabled device, you can press and hold the Bluetooth pairing button on the SRS-X3 to manually pair your device the more basic way. Like the SoundLink Mini, sadly the SRS-X3 will not display its battery status on iOS devices and there's no way to check up on the remaining battery life like you can using something like the UE Boom's expertly done voiced battery status notifications. On the back you'll find a much liked and universally used micro-USB charging input, a 3.5mm audio input in case you'd like to connect a non-Bluetooth enabled audio source, as well as this unusual reset button. This is the first time we're seeing a reset button on a portable Bluetooth speaker mind you. But hey, a reset button is better than no reset button right? I'm definitely very impressed by the SRS-X3's audio performance knowing that it's fairly priced and not that much bigger than your typical stereo Bluetooth portable speaker. It's striking how much clarity and deep bass comes out of the SRS-X3 without it sounding muddy and distorted. Sony's audio prowess really does make an entrance here. The moment you first hear this speaker play your music you'll be blown away by how rich and full it sounds while vocals come to life, details present themselves in the midrange and the low-end follows with a clean and controlled, yet impactful kick starting at very low volumes. But unfortunately the SRS-X3 does have its own limitations. For instance, that lovely deep and punchy bass becomes noticeably less present and weaker than ever when raising the volume above halfway. Which is a bit disappointing, but if used under moderately comfortable listening levels then this should never really bother you at all. It's only when you take this speaker outside and need to push it all the way that you'll lose some of its rich bass qualities, which is a shame really. That said, you can't expect such a small speaker to blast heavy bass at full volume as there are obvious power and hardware limitations. Suffice it so say at this size, there's nothing out there that beats the SRS-X3 as well as the SoundLink Mini. So how does Sony's $150 SRS-X3 compare against two of our most favorite portable speakers: the $200 UE Boom and SoundLink Mini? The SRS-X3 has a feature called ClearAudio+, which is what that ‘sound’ button is at the top of the button interface, which essentially puts a spotlight on vocals and brings the highs up front with additional clarity and brightness without degrading the bass response and midrange detail. As gimmicky as it sounds, it really isn't. It’s on be default, and we think that the SRS-X3 undoubtedly sounds best with it always on. Don’t even think about turning it off. Why did Sony even bother putting that as a feature option really confuses me. Don't think that only the SRS-X3 performs its best at medium volumes though. Both the SRS-X3 and SoundLink Mini are digitally limited to sound as best as possible at any volume, which is why they'll both lose their bass presence once you start pushing the audio level above the medium setting and will start to sound much thinner and less rich as a result. Aside from that, we found that the X3 has better instrumental definition and a more defined midrange when compared against the SoundLink Mini, and we really did not expect such a clear result. When it comes to bass response, the SoundLink Mini is known for this stuff and doesn't disappoint as it is slightly stronger still, however, the SoundLink Mini's bass sounds overpowered in comparison. It doesn't sound as clean as the SRS-X3 because it overpowers the highs in order to try to impress, yet it falls short when directly compared against the X3. Vocals don't sound as clear and are slightly recessed, highs aren't as bright and the midrange isn't as clean as they are when listening to the SRS-X3. The biggest difference in sound quality between these two speakers is that the SoundLink Mini sounds darker and more bass heavy compared to the SRS-X3, which sounds very clear and open. Sony's ClearAudio+ really does help the SRS-X3 deliver brilliantly clear and rich audio when turned on, which is what helps it rise above the SoundLink Mini's somewhat muddy midrange and bass-rich sound signature with more life-like vocals and great instrument separation. After listening to the SRS-X3 for 5 minutes and then switching back to the SoundLink Mini it became clear that the SoundLink Mini is once again too warm and lacks the clarity you would otherwise get with the SRS-X3 and UE Boom. It may not be this easy to spot when listening to these speakers at a retail store, but Sony's SRS-X3 does overall perform better than the SoundLink Mini with improved clarity and polished bass response that's much more appealing to experience when listening to all music genres - and at a more enticing price point to boot. And since it has already been more than a year since Bose introduced it, suffice it to say that the SoundLink Mini is due for an upgrade. Hopefully the SoundLink Mini 2 will give Sony a run for its money because we really do love its compact form factor and impressive build quality, but until then we think the SRS-X3 feels like a very compelling alternative and with a more enticing price tag. That also leaves you with an extra $50 in your pocket which you can spend on a protective carry case for your newly acquired SRS-X3. Unfortunately like Bose, Sony is not in the business on giving away accessories with its products so a nice hard foldable carry case will set you back $20. Another one of the battery caveats we came across when using the SRS-X3 is that when it reaches a low battery status it'll automatically cut the volume in half and will not let you raise it above that, supposedly so that it'll still be able to perform at its best with little power left. It's the first time we've come across this kind of restriction. Then again we are talking about Sony here. Ooh, shots fired! 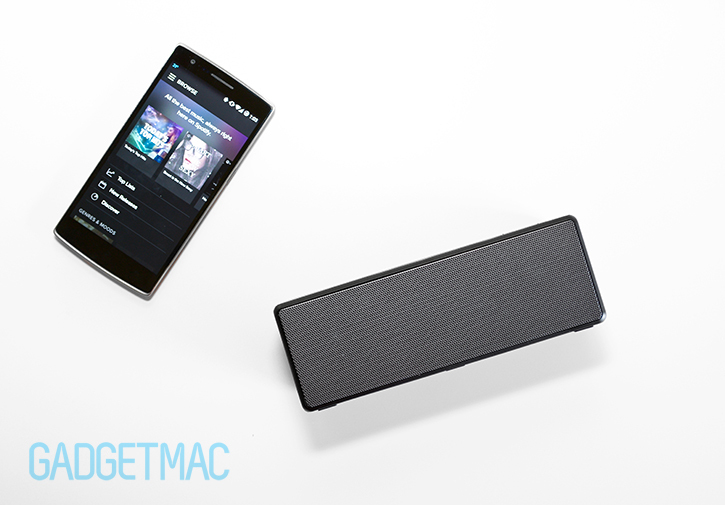 Another noteworthy competitor is the Ultimate Ears UE Boom. One of our most favorite all-around portable Bluetooth speakers that features some great features like a water and sand-proof durable construction as well as a 360-degree audio output, two things that the SRS-X3 and SoundLink Mini regrettably lack. It's also extremely loud and delivers amazingly clean and clear audio quality. That's all great news, but the UE Boom is just not as rich sounding as the SRS-X3. It may be incredible 15-hour battery life, but it costs $50 more and doesn't even compare against the SRS-X3's deep bass response. 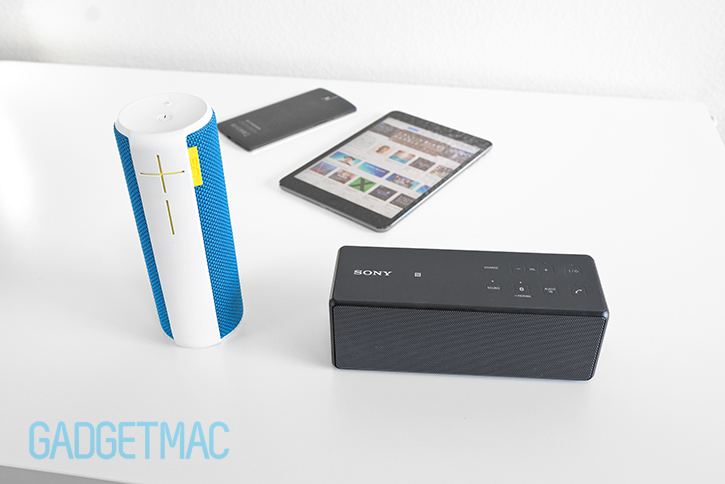 So unfortunately, we can't recommend that you get the UE Boom over Sony's X3 this time around purely because we prefer the full audio experience afforded by the X3. There's simply no subtitle for impactful bass when it comes to listening to music and watching movies. Having said that, we still highly appreciate the UE Boom's performance and superb build quality, reliable extended battery life and consistent firmware and software feature upgrades made by Ultimate Ears. For the first time we've experienced a louder sounding speaker similarly sized than the UE Boom, which is indeed the X3 and I'm quite impressed by that finding. That said, it is marginal. You should without a doubt get the UE Boom over the SRS-X3 if you care about longer battery life, fast charging, durable protective construction and a more social 360-degree audio output. When the time comes to make a final purchasing decision you could spend $200 on the SoundLink Mini by Bose, or you can save $50 and buy the SRS-X3 from Sony, which we think is the better sounding speaker out of the two. 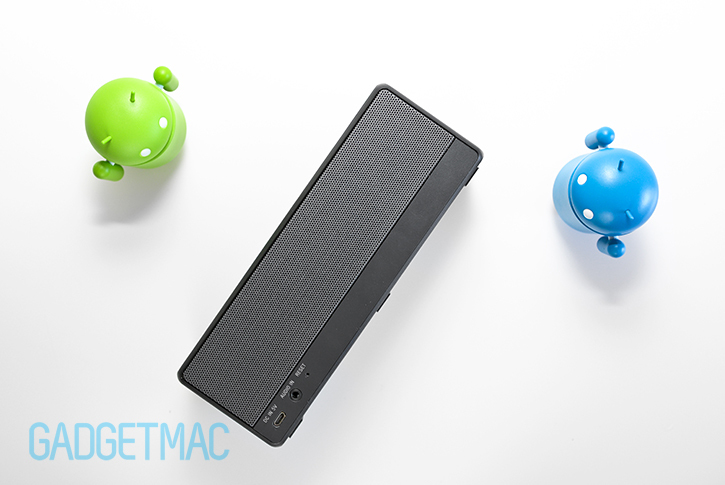 And in fact, it also outperforms another favorite of ours – the UE Boom. But as much as we like and prefer the SRS-X3's audio performance versus the SoundLink Mini, it has a few shortcomings that need to be fixed or at least considered by you and as does the SoundLink Mini. Before you pick one up yourself, you should take into consideration that the SRS-X3 cannot be powered on whilst it's charging, takes considerably longer to charge compared to similar speakers, has a limited volume level when it's low on battery and doesn't sound as good as it usually does at higher volumes due to its DSP, which limits the bass response. With that in mind, we'd love to highly recommend it but since these are some troubling drawbacks we can only wish Sony would quickly address this somehow using a firmware update, which we highly doubt that will ever happen. So for that reason we will settle for a general recommendation. Sony's SRS-X3 has its fair share of drawbacks, but it did not disappoint when put up against Bose's SoundLink Mini and ultimately offers a bigger bang for your buck in terms of audio performance. If you're looking for a portable Bluetooth speaker that delivers huge sound that's brilliantly clear and rich on bass, then the best sounding speaker out of these two has got to be the SRS-X3. That is, as long as you listen to music with the volume dialed on medium. And really the same also applies to the SoundLink Mini. The SRS-X3 has the same decent 7 hour battery life as the more expensive SoundLink Mini, as well as great but not as impressive build quality, speakerphone with on-board control interface as well as NFC Bluetooth pairing. With it's brick-shaped form factor, the SRS-X3 is a bit larger and not as streamlined as the SoundLink Mini or even the UE Boom for that matter. 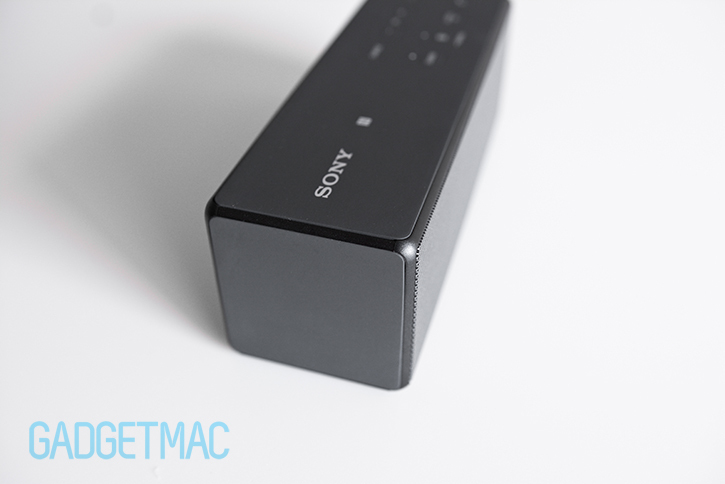 Though it's a small inconvenience worth taking in exchange for clearer audio quality. It's tough to beat at less than $150, unless you're willing to pay more and lose some of that aforementioned portability in the process, in which case Sony's $200 SRS-X5 portable Bluetooth speaker takes audio quality to the next level from what was mentioned here.